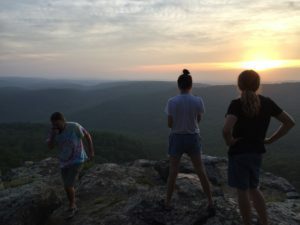 Sunset at White Rock, in the Ozark National Forest. Bluffy, treed, remote. 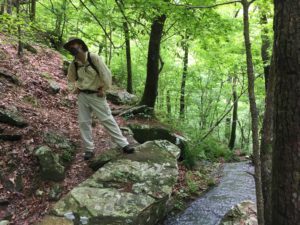 Wonder what to eat on a deep-in-the-woods car camping hiking adventure? 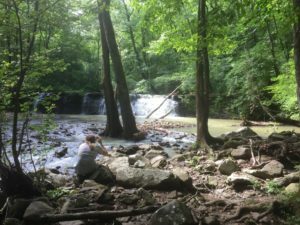 I can tell you what we did: we’re just back from four nights in the Ozark National Forest at White Rock Mountain Recreation Area, which I highly recommend if you’re eager to get away from the sights and sounds of civilization. 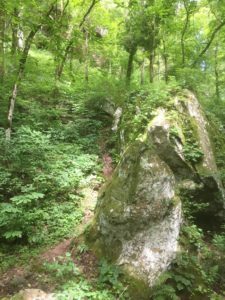 This breathtaking, densely treed wilderness is bluffy and jeweled with boulders, creeks, and waterfalls. And, it’s at least an hour of rough driving from anything resembling a grocery. The camp host, however, sells ice, helpful in keeping your cooler chilly. Tools & Menu Planning. We packed a 2-burner camp stove, a kitchen bag containing saute pan, saucepan, stockpot, 2 cutting boards (so we could all help out), 2 knives, flatware, some stir/serving utensils, sponge, soap, dish towels, lighter, and enamel camp bowls and plates. We brought a plastic salad bowl; didn’t use it. The saute pan we used just once, so I’ll rethink taking it although it packs easy. 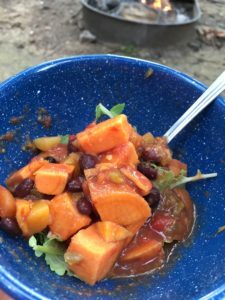 Our meal planning focus, other than whole-food, plant-based oil-free eating, was to limit reliance on the cooler, including alot of fare that could be packed dry. We’d consume the most perishable food first. I planned two suppers, Margeaux and Josh the other two and you’ll see that we thought alike. But no matter. For breakfasts – Raw oats, just like we do at home. We brought almond milk in tetra packs, keeping the opened one in the cooler. We did the oat bowls deluxe style and more indulgent than normal with seeds, coconut flakes, and dried fruit. Yum. 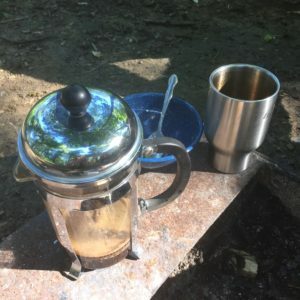 French press is same size as camp coffee percolator, so we took it along! 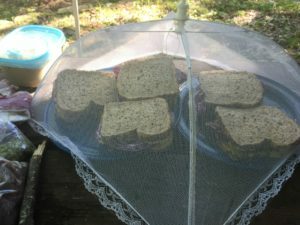 For lunches – Thick slices of cabbage on sandwiches of Ezekiel bread spread with mustard, spicy garbanzo spread (we brought two 3-cup containers of my go-to hummus, pulling one container from the fridge and the other from the freezer as we headed out), drizzled with Tabasco and a few banana peppers. Lots of flavor, crunch, and volume. Good-looking yam-bean-greens dinner, even halfway through the second bowl . Supper #2 – Whole grain pasta with sauteed onion and mushrooms, homemade marinara, served over Swiss chard from the garden. Cubed and cooked sweet potatoes and lentils with salsa and nooch over Swiss chard. 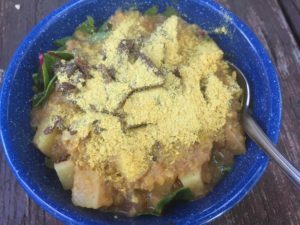 Supper #3 – Sweet potatoes, cubed and cooked with lentils, served with savory salsa and nutritional yeast over Swiss chard. Supper #4 – Whole grain fusilli, jarred pasta sauce, nutritional yeast. 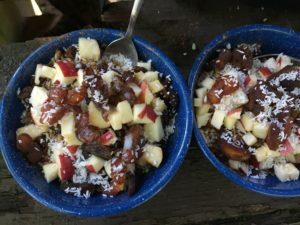 Notes: On past camping treks, I’ve brought a large container of Ann Esselstyn’s Black Bean Corn Salad straight from the freezer. It makes a nice bowl meal, along with salsa. For back up, we brought two packets of organic brown rice and lentils which could be heated in boiling water the stove, but we didn’t need them. 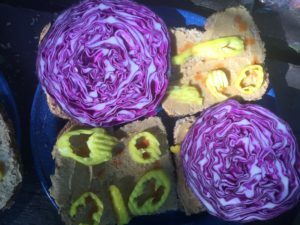 During our car travel on the way down, we lunched from a small soft-side cooler filled with roast potatoes, fresh carrots, cabbage wedges, and other goodies. On the return trip we indulged in a vegan supper at Kansas City’s Cafe Gratitude, which would be a lovely vegan restaurant except for that it’s big on oil. Grrrr. They do have full info on what’s in each dish, so I could chose a low-oil option. Crab walking down a muddy path got us to this spectacular and wide waterfall. 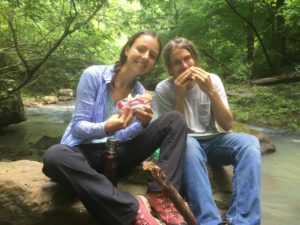 One day, we got to eat our sandwiches sitting on rocks with water flowing right by.